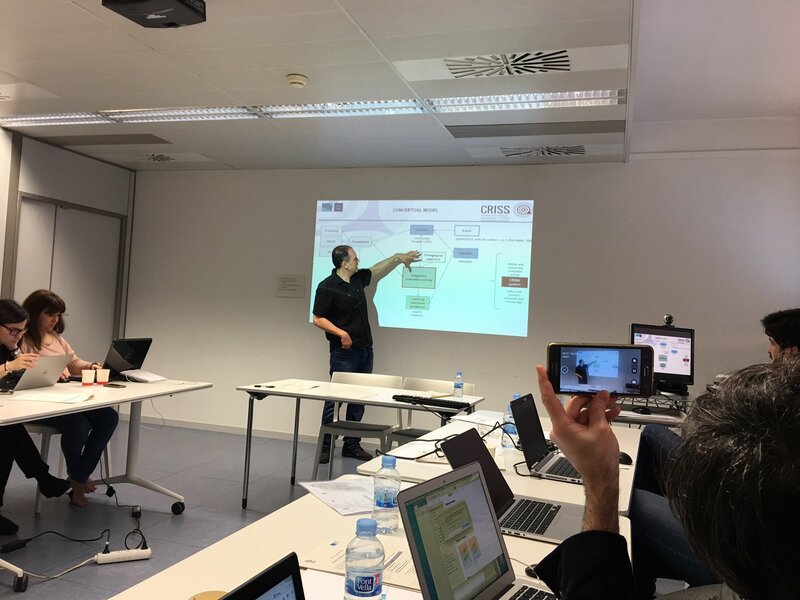 On the 16th and 17th of march, the Edul@b research group hosted the meeting between the partners of the European H2020 CRISS project (Demonstration of a scalable and cost effective digital-based learning infrastructure through the Certification of digital competences in primary and secondary Schools) at the headquarters of the Open University of Catalonia in Barcelona. The meeting was attended by EXUS (United Kingdom), MyDocumenta (Spain), la Faculty of Organization and Informatics FOI of the University of Zagreb (Croatia), the UCL Knowledge Lab of the University College London UCL (United Kingdom), Education4sight (Germany), l’Escola Pia de Catalunya (Spain), Edul@b (Spain) and the Joint Research Centre of the European Commission in Seville. The main objective of this meeting was to present and discuss the first draft of the Framework on Digital Competencies for primary and secondary school students, designed by Edul@b. The design of the conceptual part that is being elaborated in these first months of project will serve to provide concrete indications to the implementation of the platform. On the first day of the meeting, the first proposals have been presented on: the definition and structure of the Framework, the e-Assessment approach that will be used to evaluate digital competencies and certification methodology. Ideas have also been shared on the design of educational activities aimed at the evaluation and certification of students. The second day was devoted mainly to the discussion on the technological requirements and the functionalities of the system and the points of integration between all subsystems of the CRISS platform. The next plenary meeting of the CRISS project will take place next June. The project is coordinated by the British organization EXUS Software LTD and involves 15 different partners from 9 countries, including the Edul@b research group of the UOC. CRISS aims to provide an innovation infrastructure for personalized learning and teaching of digital competences to support and motivate teachers and students; work towards the implementation of digital competences acquisition, evaluation and certification in European primary and secondary schools; and provide open, interoperable components for a flexible, scalable and cost-effective cloud-based digital learning infrastructure. In the pilots of the project will participate more than 490 schools including 25.400 students and 2.290 teachers.